I started standing more erect and closer to the ball, with the ball positioned back in the stance. The key was to hit to hit as little grass behind the ball as possible. I now set my golf club on its toe, at address with the shaft almost vertical and my feet close together. I use a short steep back swing, hit down abruptly on the ball, with little follow-through. The ball now pops out of the grass and lands softly on the green. Using just the toe is key to this shot. When I played the shot from my regular address position, the golf club head would tend to get caught in the grass. But the toe doesn't. It glides through the grass smoothly and slides under the ball with ease. Now I get a nice clean shot. Don't let tall grass ruin a chip. No matter if you are playing at a premium Thailand golf course like Banyan Golf Club, Hua Hin or at a run-of-the-mill golf course like Royal Chiang Mai Golf Resort. 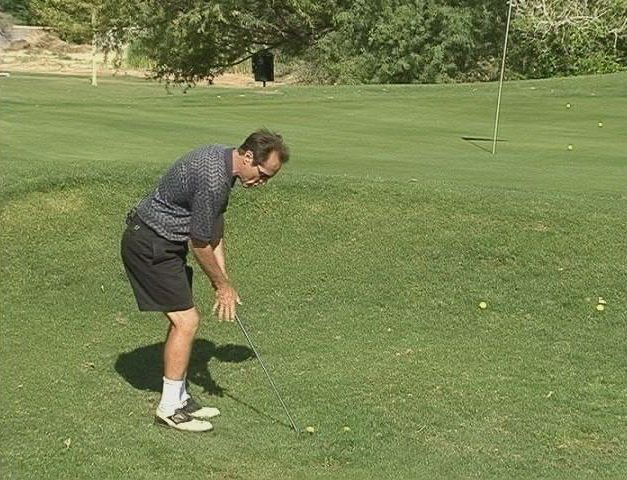 Use the toe's ability to pass through the grass smoothly to knock the ball close to the pin. Learn use a variety of clubs around the green depending on how far you want the ball to roll once it lands on the green. Have fun and enjoy golfing in Thailand.